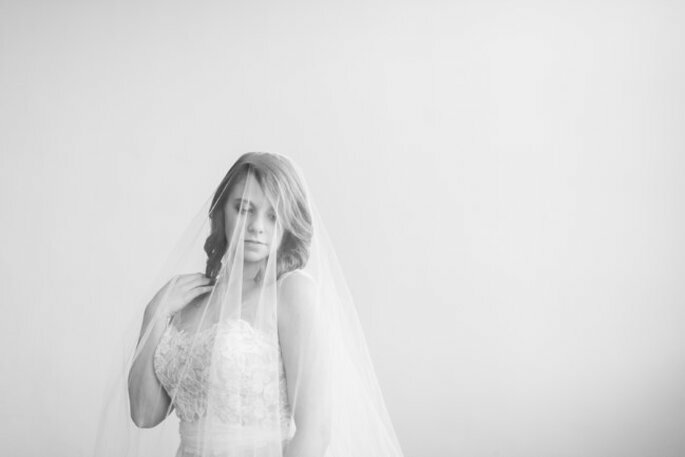 How to look gorgeous in your bridal veil - the essential pro tips by a wedding veil professional. Choosing the right wedding veil to wear can seem quite overwhelming for a bride. Veil lengths, materials, or embellishments all add up to one thing: countless options! With that in mind, I have put together a list of do’s and dont’s to help brides find and wear the perfect veil. Choose the wedding gown of your dreams before buying a veil. Once you choose your gown, then find a veil that compliments your dress and won’t distract from it. In this case, opposites do attract. An intricate wedding dress calls for a simple veil. Likewise, choose a veil with more embellishment if your wedding gown isn’t extravagant. Consider the edging for your veil. If you prefer a clean ribbon edge finish, keep in mind that you may appear shorter due to the horizontal line across your back. Get a friend to take snapshots from all angles and make sure you look amazing! Choose an appropriate veil for your venue. A formal wedding ceremony in a grand church calls for a longer, more dramatic veil, whereas a birdcage veil would be appropriate for a small city hall wedding. Purchase a wedding veil and accessories at least 2 to 4 months before your wedding day. Consider environmental factors. Getting married outdoors means there could be a chance of wind. My suggestion is to select a shorter, heavier veil like a birdcage veil or a two layer veil. The last thing you want to do is tame a veil that has been picked up by a gust of wind. Decide who will have the honor of unveiling the bride if you plan to wear a blusher over your face. This job is either undertaken by the father upon reaching the altar, or the groom after pronouncement of husband and wife by the officiant. Practice with your hairstylist how your hair will look long before your wedding day. Allow time to play with the position of the veil for maximum comfort and beauty. When your big day arrives you will know exactly where to place the veil, without ruining your formal hairdo. Match your veil and gown embellishments exactly. The rhinestones, pearls, and sequins on your wedding dress can be slightly different from the ones on your veil. Wear your long, formal bridal veil for the entire wedding reception. Small veils can be worn for longer periods of time while longer veils should be taken off either after the ceremony or after the first dance. Are you a bride that needs a little more veil guidance? A great place to get advice and custom veils is www.ClassicVeils.com by Love & Lavender Weddings. Manolo Blahnik Will Make You Feel Like a Celeb On Your 2019 Wedding Day! Choose Christian Louboutin For the Perfect Bridal Shoes for 2019! The most beautiful veils we could find for 2019 are in this gallery - so check it out, and find the perfect style for you today!